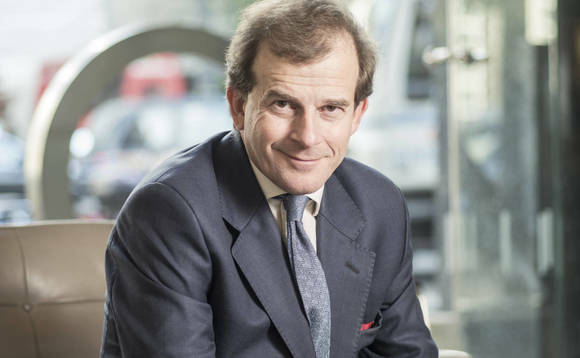 With international sales outstripping the UK business, Jupiter’s vice chairman Edward Bonham Carter has discussed the global path forward for the UK manager, including its SICAV in an era of Brexit. Gary Robinson caught up with him at the company’s London headquarters. The competitive spirit is a key driver behind any successful fund manager and business leader. For Edward Bonham Carter, the appetite for success is arguably embedded in his very DNA. Having a successful younger sister in film actress (Helena) has possibly helped drive this competitive spirit, but the family tree also includes great-great-grandfather Herbert Henry Asquith – Liberal prime minister of the United Kingdom from 1908 to 1916, the last to lead that party in government without a coalition – and grandfather, Don Eduardo Propper de Callejon, who in 2008 was posthumously awarded the title ‘Righteous among the Nations’ by Israel’s Holocaust Memorial for his role saving hundreds of Jews in the Second World War. There is much to live up to, and rather large footsteps to follow in, but it is not something that has ever gotten in Bonham Carter’s way. And in the asset management world Jupiter’s vice-chairman is perhaps just as well-known, or even better known, as his illustrious relatives. Indeed, given the development of the business over the past decade or so under his leadership, he can afford a relaxed manner when proffering his outlook for the company from its headquarters off Victoria Street in Westminster, London. “The last time we’d just gone through the type of market growth felt in the last few months with the FTSE was in 1999, and we were at about £12bn,” he says. The advantage of previously having been through turbulent times on markets – today driven by reactions to president Donald Trump in the White House and Brexit uncertainty closer to home – is that Bonham Carter can reference the benefits of hard work. ‘Success’ has always been “an output of the corporate strategy rather than an aim in itself”, says Bonham Carter, without, he adds, wanting to sound “overly clichéd”. The Jupiter SICAV has reached some £10bn of assets, against a relatively tiny amount when launched. The irony of growth and success of Jupiter’s products across Continental Europe at a time when the UK appears to be drifting further away is not lost on Bonham Carter. And what about other international jurisdictions? “Hong Kong has also grown and is now 12-13 people. We have the office in Singapore. So, it is not just about Europe,” says Bonham-Carter. “It is all about making sure, have we got the right products and have got the right infrastructure to support those sales to clients, and secondly, a wider platform that can service those clients,” he says. He also acknowledges the importance of the growth in the company’s fixed income business as a “big change” with the asset base now around £10bn. “As Martin reminded me, when Jupiter was funded in 1986, BlackRock barely existed and now they are about 10 times our size,” says Bonham Carter. “Size is not everything. It is all about quality rather than width,” he laughs. That ‘quality’ is something that the international market seems happy to embrace; the past year is the first in which Jupiter has done more business internationally than in the UK. “That’s right, partly because we’ve been in the UK a long time and it has got a rather mature book, so you would expect that if you are doing a half decent job in these markets,” Bonham Carter argues. Still, there can be no mention of the success of a UK business without these days mentioning associated risks of Brexit. Bonham Carter believes that it is still early days in terms of any sort of predictions. The obvious point, though, is that Jupiter has a Luxembourg SICAV range to help with any fund passporting issues – not, he hastens to add, through any specific foresight, but something that has been done like many other fund managers. “Will Brexit bring a fundamental change to our business?” he asks. Speaking on the company’s 2017 plans, Bonham Carter notes that it is all ‘evolution’ rather than ‘revolution’: Jupiter is planning to boost the product areas in which it is already doing well in. Fixed income, multi-asset, European and UK Equities are important, but it is also key to build up new products in areas such as absolute return and Asian income, he says. On new hires, he says that it is important that the business has a “gravitational effect on like-minded people that say ‘yes, that’s the sort of business I want to be part of’. “Most fund managers by definition are pretty responsible people. It is a responsible job looking after people’s savings, their aspirations for the future and the means to make it happen. It is very important,” he says. Outside interests and family are important to Bonham Carter. A working week that is now down to four days, since relinquishing the Jupiter CEO role, allows him time to walk the family dog around his neighbourhood in Barnes, London and enjoy his family time more. So, with the work life balance in order, what of the industry? Is he still loving it? And what would his legacy be? More than 30 years’ experience in the investment market with positions at Schroders and Electra Investment Trust and 20 years working at Jupiter, including seven years as CEO, Bonham-Carter has extensive knowledge of fund management business. Joined Jupiter in 1994 as a UK fund manager, after working at Schroders (1982-1986) and Electra Investment Trust (1986-1994). He was appointed chief investment officer in 1999 and joint chief executive in May 2000. He became group chief executive in 2007 and led Jupiter through its management buyout that year and its subsequent IPO in June 2010. He relinquished his role as chief executive in March 2014, on Maarten Slendebroek’s appointment and became as vice chairman focusing on engaging with the company’s key stakeholders, including clients, prospective clients and industry bodies. Joined the board of Land Securities Group plc as a non-executive director and member of the Remuneration Committee in January 2016, and was appointed senior independent director in July 2016. He is also a director of The Investor Forum.